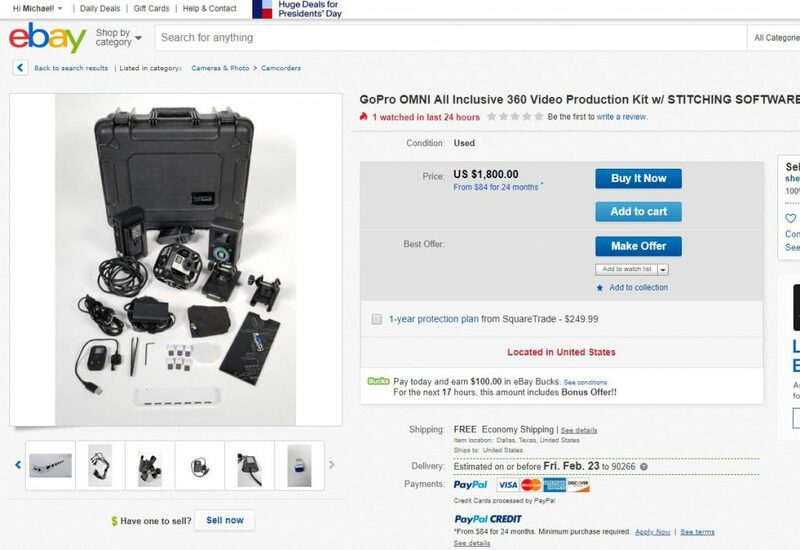 Spotted on eBay: complete GoPro Omni rig for $1800 (or get a brand new one for $2300). The GoPro Omni was originally $5,000. The GoPro Omni is one of the most popular professional 360 camera rigs. The Omni consists of six GoPro Hero 4 Black cameras, which can each shoot at 4K 30fps. The stitched video resolution is 8K. As an aside, the Hero 4 Black sounds old but it actually has the same sensor as the GoPro Hero 5 Black, so its sensor is technically only one model away from the cutting edge Hero 6. Besides having to insert the Micro SD cards correctly, it seems very similar to the workflow for GoPro Fusion actually. Autopano Video Pro is not cheap at around $750. The cool thing about this eBay listing is that the software is included (as is the dock for the Micro SD cards). According to the listing, you get both Autopano Video Pro AND Autopano Giga (worth $250). It also includes an external V-mount battery. By comparison, the 8K Insta360 Pro (reviewed here) is $3500. B&H has the rig (without the cameras and without the software) for $2221. I would have considered getting this rig myself if I didn’t already have the Insta360 Pro and a 6-camera GoPro rig (yes I will post about it next time). Please note: I don’t know who the seller is and I have no relationship with them. Thank you very much for using the affiliate links here (including the ebay listing) to support 360 Rumors at no additional cost to you so I can do more tests and reviews.